The following case is one I have came across many times. It's a frustrating case, one of those cases where you come up with a possibility and then something don't add up and your back at square one. 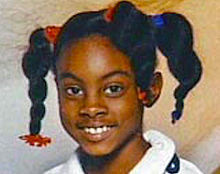 Asha Jaquilla Degree was only nine years old when she disappeared from her home in Shelby, North Carolina on February 14, 2000. For reasons still unknown to her family Asha packed her book bag full of clothes and started walking along North Carolina's Highway 18 in the early hours of that morning, despite stormy weather of heavy rain and winds. It is reported that several motorists claimed to have seen Asha walking along the highway. One motorist concerned to see such a small child out at that hour turned around and as he approached Asha, she ran into the woods. Asha was born August 5, 1990. She was 4ft and 6 inches tall. She weighed about 60 lbs at the time she went missing. She was last seen in a white shirt and white pants, she was also wearing Pig tails in her hair. Asha's disappearance didn't make sense to investigators. They couldn't find a reason for Asha to run away. Asha was nine years old, typically it is 12 year old's or older that run away. They also couldn't find an obvious reason in Asha's home life for her to choose to run away. Asha's parents Harold and Iquilla actually married on Valentines Day in 1988. Asha was born two years later in 1990. Harold and Iquilla also had a son, O'Bryant. Asha and her brother were raised in a sub division in a rural area north of Shelby. The Degrees raised their children sheltered from outside influences. They centered their lives around family, school and church. They did not keep a computer in the home. Asha's mother worried about pedophiles getting to her children if she allowed a computer in the house. Asha's mother describes Asha as being a shy and cautious girl who was content to stay within the limits her parents set. Asha seems to have been a reserved timid girl as well. She was terrified of thunder and dogs. Her mother thought because of this Asha would have never left the house. Asha was in the 4th grade and attended Fallston Elementary school. Both Asha and her brother played on basketball teams, Asha was a star point guard. On February 12, Asha's team had lost its first game of the season. Asha was upset because she had fouled out. After crying a bit over the team's loss Asha seemed to have gotten over it that night and watched her brother's basketball game. The following day, February 13th, Asha and her brother went to church from a relatives house. Harold worked second shift at a nearby PPG Industry plant. Iquilla had put the children to bed at 8 pm. The children shared a bedroom. The power had gone out that night because of a car accident that happened near by. Harold returned from work around 12:30 am and the power was restored a short time after he returned home. Harold checked on the children when he first got home and again when he went to bed at 2:30. The children were both asleep in their beds. A short time later O'Bryant heard Asha's bed squeaking, assuming she was just changing positions he went back to sleep. Apparently it was around this time that Asha got out of bed and took her school book bag packed with several sets of clothes and personal items and left her home between 3:45 a.m. and 4:15 a.m. Iquilla woke at 530 am to get the children ready for school, because the power had been out the children had not got their bath. After she prepared the bath she went to wake the kids and found only her son, Asha was gone. Iquilla searched the home and began to panic waking Harold to tell him his daughter was missing. Initially Harold thought maybe Asha went across the street to see her grandmother but a phone call revealed they had not seen Asha. The first police officer arrived at 6:40am. An intensive search for Asha began that day. Police dogs were called in but because of heavy rains they could not pick up Asha's sent. February 17th, a few days after Asia went missing there was a small break in the case. There was a shed in the direction where Asha had ran off into the woods when the motorist had turned around. Inside the shed they found candy wrappers, a Mickey Mouse shaped hair bow, a pencil and a pen. They confirmed these items indeed belonged to Asha Degree. The trail goes cold at the shed. It was looking bleak when in August 2001 her book bag was found. Strangely the book bag was wrapped in two trash bags inside the book bag was several sets of clothes basketball uniform and pictures of Asha's family. The book bag was found 26 Mi away from Shelby North Carolina at a construction site. Several questions run through my mind. Why was the book bag wrapped in two trash bags? Was somebody trying to intentionally preserve what was inside or to hide it? Did somebody want the book bag to be found? What happened to Little Asha after she was in the shed? Why did one of the several motorists that reported seeing Asia not call the police right away after seeing a small child out at that hour of the morning? The F.B.I. ran tests on the book bag but didn't release their findings to the public. In May of 2016 the FBI said they possibly have a new lead. They have asked the public to be on the lookout for a car multiple people think they may have seen Asha get into, A Lincoln 1970 Continental Mark in dark green or a Ford Thunderbird from around the same year. Investigators say they continue to make progress with this case and receive information. Asha's family continues to pray for her return. They will never give up on their daughter or the hope that one day she will come home. They keep Asha's memory alive by having an annual walk each year. Family, neighbors and people from the community come out each year to walk with the Degrees. They Mark the memory of Asha Degree with a billboard in the location where she was last seen. They have also got a scholarship going in Asha's name. My heart goes out to this family. It's very important we keep awareness going for cases like Asha's. We can all do some small task to lend to the light that will lead loved ones home.